The new year explodes with expectation, hope, pain and regret, and wishes for the future- a chance to "erase" the problems of our past year and move on. But without making space for reflection and an honest look at our accomplishments and mistakes, we can become prisoners to our own rigid expectations. There are ways to remain focused, yet flexible. You can turn your attention to what you already love about yourself, and want to love more about yourself. This doesn't mean ignoring your pain, but it does mean making room for all of you. In honor of Eating Disorders Awareness Week, I wanted to share some thoughts on the intersectionality of shame, disordered eating, and body image. Shame is a big player in eating disorders. Understanding shame starts with becoming aware of what it feels like, what triggers it, and building enough tolerance for it so that you can learn where these voices actually come from (chances are, they didn’t start with you). Shame is often a trigger for a food or exercise binge, or for the forceful power that perpetuates self-disgust and restriction. It’s that lead blanket that keeps you in bed for days on end. It’s the feeling that keeps you from spending time with your friends, because you’re afraid that whatever you say will expose you as being worth rejecting. It’s the part of you that thinks: If I eat this, I am bad. Since I ate this, I am bad. If I don’t run today, I am bad. It may be hard to hear me talk about these feelings, so let me add: While these feelings are real, and they come from messages you’ve internalized throughout your life, they are absolutely not the truth. When we talk about shame, we are also talking about our capacity to love and to be connected. Sometimes, being connected hurts. We have no power over other people’s minds, feelings, opinions, or behavior- but throughout our lives, we are dependent on others to help us survive. From the moment we are infants needing nurturance, holding, food, love, and warmth, we depend on an “other” to care for us, since we can’t do it for ourselves. Gradually the understanding emerges of an “other” whom we totally depend on but cannot control. Babies will use their gaze, coos and cries, and smiles to influence the caretaking of another person, which develops into how we negotiate relationships as adults. When we don’t get what we need from this very powerful “other,” it stresses our bodies out- we go into one of the fight-flight-freeze-appease modes, depending on what we learned works in tough situations. This raises the stress chemicals in our bodies, shifts our hormones, and allows us to “cut off” psychologically and emotionally the part of our self that has needs. This, unfortunately, is the perfect environment in which to cultivate an eating disorder: Cut off and push away the parts of yourself that tell you what you need, because they are too painful to feel without having the power to tend to them. In recovery and with therapy, you can learn how to reconnect to those parts of yourself that have needs, wishes, desires, beauty, wants, envy, pain, terror, and joy. It can be difficult and painful, much like having your leg fall asleep and then beginning to feel the pins and needles of reawakening. But it's a path to aliveness- of discovering yourself, and discovering what you really love. And, eventually, discovering- through the help of other people- how you have power and agency when it comes to your relationship with your needs and your heart. And, oh! To really love! And feel the way loving and being loved gets into your bones! What a beautiful feeling. don't let being afraid stop you from loving yourself. Because, as an adult, you actually can learn to identify, take care of, and celebrate your own needs and dreams. But none of us can love ourselves and be loved in a vacuum. As activist Virgie Tovar tweeted, “Envision the life you want. Find the people who will help you live that life. Love them unconditionally. Repeat." Your body is your business. Your health is your business. Nobody but you can decide what is right for you. But how can you make real decisions about what is right for you without having access to all parts of you? Learn how to listen to your body, how to listen to what you need, even if it hurts. Because we are all connected, and learning how to let people in who love you and can help you begin to realize how to be wholly, powerfully you. Because you are worth listening to- always. Reach out to me at 510-594-4035 or therapy at mollymerson dot com if you would like more information about how to learn to listen to your needs, and navigate these overwhelming and distressing feelings. 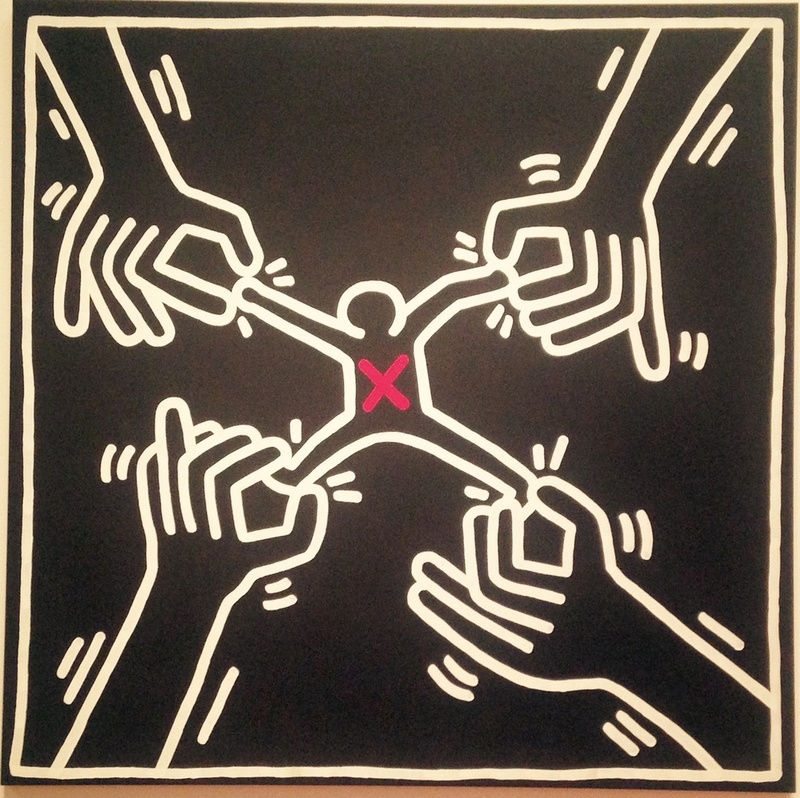 Keith Haring, "Untitled," 1985. Feeling pulled in many directions? Learning to love your body might help! The Learning to Love Your Body group is kicking off this weekend, and I’ve got some pre-work for people who are registered and signed up. But in case you’re wanting a taste of what this group is about, I’ve decided to share it here so that you can feel fed and engaged by the possibility of living a life where you cherish, love, listen to, and enjoy your body. First, have you seen Jes Baker’s talk about the Social Impact of Body Love on Everyday Feminism? If you haven’t, take a look here. We’ll be talking about this video on day two of the group, but it’s so ripe with content that it’s worth watching a few times over. Some of the statistics might surprise you. (Did you know that 81% of 10-year-olds are afraid of being fat? And that they’re more afraid of being fat than they are of cancer, war, or losing both their parents?) Jes Baker also has an awesome blog at www.themilitantbaker.com. Next, I’m encouraging everyone to purchase or borrow a copy of Embody by Connie Sobczak. I’ll be using some of the exercises from this book in our group, and we’ll be reading passages from the five Core Competencies of the Be Body Positive model. We’ll start with learning how to Reclaim Health, meaning, how to live in a way that prioritizes a holistic view of health with you as the expert of your body. Practicing intuitive self-care, cultivating self-love, declaring your own authentic beauty, and building community are the remaining competencies, and we will explore how to integrate these in your life in the Learning to Love Your Body group. Finally, here is a set of questions to get you started on the path toward learning to love—and listen to—your body! 1. What kind of messages have I received about my body throughout my life? Where do they come from? What do I believe about my body and other people’s bodies? 2. What do I wish I felt about my body? If I felt free enough to be in love with my body, how would I know? What would be different in my life if I felt more love for myself and listened to myself? 3. What might be blocking me from loving my body and living fully in my life? If you’re not planning on participating in the group, or not able to make it in person, try this exercise with a friend or two. When you set into your intentions and allow your creative self to come forward, you might like to light a candle and some sage, juniper, or copal, and carve out about 20-30 minutes to write in silence. If you and some friends sit down to do this together, try setting your individual intentions out loud with each other in just a few words, and then when you’re finished writing, share what your process has been and what you have learned from responding to the prompts. If you'd like to learn more and see a video where I describe more in-depth the intention and practice of the group, visit my page Body Love Group. You can also call me at 510-594-4035 or send me an email at therapy@mollymerson.com . I look forward to hearing from you! To cite this page:Merson, M. (2015) Learning to Love (and listend to!) Your Body. Retrieved month/day/year from http://mollymerson.com/2015/02/02/learning-to-love-and-listen-to-your-body/. Please note that this column is not intended to treat, diagnose, or prevent any disease. This post is for entertainment and informational purposes only. I do not offer advice to people whom I do not know and whom I am not currently treating in my practice, and even then, it is not a general practice for me to offer advice to my clients as their decisions are their own to make. If you are in need of mental health support, please seek out a licensed professional to begin ongoing therapeutic treatment. There is something about intention setting and new year reflections that requests a video blog in addition to a written piece. In this video, I talk about getting comfortable with uncomfortable feelings, about reflections, and about creating space within yourself for light, warmth, and manifesting your own creative spirit. Just like in a written blog, these prompts I offer are meant as starting points for a deeper process with your therapist, mentor, community, or spiritual guide to help you understand where your creative self can flourish and how you may be holding yourself back from what’s right for you in your life. Reflections can be done at any significant moment in your life, including the New Year, either solstice, birthdays, or – a very profound experience – on death days. When someone who has been a guide or mentor to you has passed, it can be very meaningful to reflect on your year with that person’s wisdom in mind. They can help you see what you’ve accomplished and where you’re headed, and perhaps offer a redirect for you as well, if that’s something you’re looking for. For this exercise, get comfortable and give yourself enough space mentally and obligation-wise to focus on journaling. Grab a pillow, blanket, cup of tea—and a candle (if you have one), matches, and a pen and paper. We will be doing a bit of journaling right now. Light your candle, get situated, and get ready to write! First prompt: What are 10 events or situations that have been significant to you in the past year? People you’ve met or lost, relationships, events, lessons, anything that stands out to you as a growth point. Whatever comes to your mind is probably what can go on this list, as well as things you remember later on, spurred by this exercise. Give each person/event/experience its own line, and spend time meditating on what was significant about them for you. Second prompt: What would you like to see manifest in the new year? What wish, vision, and intention is inside of you itching to be set free and come alive? What would you like to create in the coming year? When you find yourself sitting here, this time next year—what goes on that “10 Significant Situations” list? Third prompt: What limits you? What do you feel is holding you back? What would you be doing if you felt like you were good enough and capable enough? Where can you offer more love, gratitude, patience, and compassion for yourself? What do you need in your life to help you manifest the wishes and dreams that you discovered in the second prompt? **I would add here, which I neglected in the video: In addition to working on offering love, gratitude, and compassion to yourself, where can you offer this to the world and your community? How can you help your community flourish and manifest the visions that benefit us all? This is by no means exclusive of growing, cherishing, and developing yourself. These go hand-in-hand. Life is full of surprises. We spend so much of our life dealing with what is right in front of us, and it can be challenging to find time for reflection. You have chosen this time, whenever it may be, to reflect and honor where you are and how you got to be here, as well as were you dream to go. In doing so, you are offering something beautiful, loving, and wonderful to yourself that will help you step into the unexpected that this new year will bring with grace and compassion. To cite this page: Merson, M. (2014) Intention Setting: Three Journal Prompts. Retrieved month/day/year from http://mollymerson.com/2014/12/26/intention-setting-three-journal-prompts/. Please note that this column is not intended to treat, diagnose, or prevent any disease. This post is for entertainment and informational purposes only. I do not purport to offer advice to people whom I do not know and whom I am not currently treating in my practice, and even then, it is not a general practice for me to offer advice to my clients as their decisions are their own to make. If you are in need of mental health support, please seek out a licensed professional to begin ongoing therapeutic treatment. going up, up, up... into your ancestral wisdom. "we are all made of starstuff," says Carl Sagan including the trees. When I read this quotation this morning, I thought about how many of the people I see in my practice struggle with how to feel as though they are “enough.” We seem to know that self-love, compassion, and abundance is part of the healing process, but it can hard for many of us to believe that we already have everything we need to live authentically and fully as ourselves. I believe it really is possible to cultivate compassion for ourselves and the people we love, and having contact with nature can help. Studies have shown that access to greenery and the natural world can expedite illness recovery, improve mental health, and regulate our autonomic nervous system (the system which controls our responses to unsafe and stressful situations). When you are feeling stress, anxiety, sorrow, anger, and other uncomfortable emotions, spending even 20 minutes in nature can help those emotions pass through you. When we pay attention to the natural world and its patterns of abundance, and allow the sounds, smells, textures, and shapes of nature to settle inside of our bodies, we can find reminders that every mood and difficult thought will pass, and something new will take its place. Most of us who live in cities find our access to natural spaces exists within urban environments. Urban parks and gardens, and perhaps even the old tree in your neighbor’s front yard, can provide healing experiences. In the Bay Area, we have ample access to natural spaces—in the East Bay, we have Wildcat Canyon, Tilden Park, Redwood Regional Park, Chabot—there are so many places where you can find an hour or so of being in the natural world. Depending on what time of day you go, it is even possible to rarely see another human being. Additionally, if your mobility is limited, there is no need to walk: Staying in one natural place for 15-20 minutes can have a profound effect on your nervous system, and can help you find answers to questions you might have on your mind. Start with an intention. In the beginning you may just want to focus on getting to know what happens for you when you are in nature. At first, your intention might be “notice my breathing” or “what colors and smells do I notice today?” Over time, you might bring a question or problem that’s on your mind, and let yourself be open to what the environment shows you along the way. You might often go back to simply “noticing,” because it can allow you to be even more open to the delightful curiosities of critters and landscape that you might otherwise be too focused to see. You might even discover something you could never have expected! Walk slowly and mindfully. Be aware of your breath, and as you walk, slowly become aware of the sounds, smells, shapes, shadows, sensations of heat and coolness, the texture of the path on your feet, what you notice in front of you and in your peripheral vision. If you wish, stop from time to time and allow sounds other than the crunching of your feet to be heard. If you find a spot you really feel connected to, stop walking and stay a while. Try not to worry about how much time you have, and about “getting somewhere.” If you find a spot that calls to you, you have already arrived. Stay here, if you can. It can take the natural world a good 20 or 30 minutes to return to how it was before you walked through, so expect new sounds and sensations to unfold the longer you allow yourself to stay. If you come across a tree that you especially love, touch it with both hands, and take three long and deep breaths with the tree. Try to feel its power, its strength, its longevity. It has probably been here for a very long time, and has seen a lot in those years. It plants its roots firmly while stretching its branches to the sky. There are a lot of metaphors to be found in trees. Perhaps you will notice something in the tree that can help you today. Look at both the macro and the micro. Notice the distance, the shapes on the horizon, the path ahead. Then, notice the roly-poly bugs, the ants, the pine needles on the ground, the birds and lizards moving through the periphery. Stop a while and notice what the bugs are doing, and how the patterns of the lichen form shapes in their movement and growth up the trees and rocks. Also notice how spectacular your long distance view is. Now: Notice that you, breathing, feeling, and seeing, are between these two places. You can contact both the long view and the short view. Breathe this in, and try to imagine this spaciousness entering into your lungs, your belly, your legs, your feet, your back, and your head. Allow yourself to be open to being delighted by the unexpected, and to being awakened by the pace and interconnectedness of the natural world. Nature offers a reminder that you are enough, because our bodies are the same bodies we feel in the trees and in the rocks and critters, all held by the same earth. You are enough, and you are connected to something bigger than you. More on Ecotherapy here: What is Ecotherapy?, Holos Institute, and Ecoutearth. Ecoutearth is a local group in the East Bay that offers monthly meetings at Redwood park to offer ways of listening to the earth and to your own heart. My training in Ecotherapy has come from Jan Stein, who is the Director of the Holos Insitutue and offers courses at CIIS. I provide therapy in Berkeley, CA to individuals looking to delve into old patterns, explore overwhelming emotions, and find room for self-love and self-care amidst a harsh and unforgiving inner critic. To cite this page:Merson, M. (2014) You Are Enough: Finding Yourself In Nature. Retrieved month/day/year from http://mollymerson.com/2014/10/30/you-are-enough-finding-yourself-in-nature/. Please note that this column is not intended to treat, diagnose, or prevent any disease. This post is for entertainment and informational purposes only. I do not purport to offer advice to people whom I do not know and whom I am not currently treating in my practice, and even then, it is not a general practice for me to offer advice to my clients as their decisions are their own to make. If you are in need of mental health support, please seek out a licensed professional to begin ongoing therapeutic treatment.